Hi my name is Quinton Crandall and I am a soon-to-be graduate from The New York Harbor school. A school in which the main focus is on Maritime life and activities such as oyster restoration, vessel operations, marine systems technology, rowing and sailing just to name a few. This is also a school that also helped me realize my love and passion for the water. School was not easy for me because at the beginning of my freshmen year my older brother was killed and I ended up missing the first 3 months of school. After my return to school I found it really hard to focus, and didn't feel motivated to put my best foot forward anymore. My brother was the person who made me feel like I could do anything, with him gone I was lost in a deep sea of grief that threaten to drown me. I was alone for a while and had to find a way to deal with my loss. That's when water became an even bigger part of my life. Being in the water made me feel safe, and relaxed, like I was in control of my own thoughts again.Throughout the rest of my freshman year the field class, which are classes designed to help us learn about the ecosystem, bodies of water and everything else maritime related, was the only class that had my attention and It played into my love for the water. My freshman year of high school turned out to be an eye-opener to my life and as to how important our oceans, rivers, lakes and the animals in them are which made me even more passionate about them. My junior year wasn't all that good considering I had to transfer schools. But it wasn't all that bad because while at the other school I earned my credits and had the chance to participate in the Duke of Edinburgh award. An challenging award for young men and women who want to better themselves and the community around them by doing activities such as physical, skill, and volunteer work. I returned to the NY Harbor school for my Senior year where I met My girlfriend who just so happened to be a scuba diver at our school. From the way she described the ocean life I knew that was for me. I felt like I needed to be in the water and So I asked to be switched Scuba CTE (Career in technical education) course and was told if the teachers agree then it would happen. The teachers agreed but it didn't happen. The more I learned about scuba diving life underwater and how many ways there was to do something about our water systems the more I wanted to join scuba. I decided to try to do it out side of school, until I found out how expensive it is. 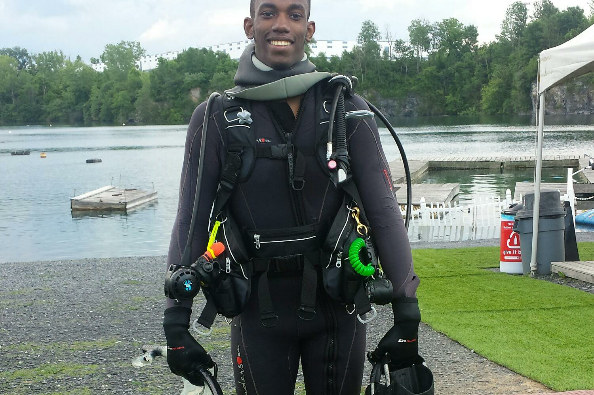 So I was stuck because just to get start cost $1000, which I had to save for a year to get certified ,But on that first breath underwater I knew that this was not only my passion but something I wanted to teach to others. To me diving became more than just the beauty of a reef but more the beauty of life not like ours. Now here I am a year later trying to advance my skills in diving so that I can pass it on to others with out them having to pay thousands of dollars. I'm not asking for a free ride (I'm working this summer ,as well as finishing school). But I am asking for your help in helping me achieve my dream of teaching other economically disadvantaged people (young and old) a fun, educational and unique experience. Any donation and sharing is deeply appreciated. Thanking you all in advance! pursue your dream, stay strong and may God continue to Bless you.